I’m getting excited. 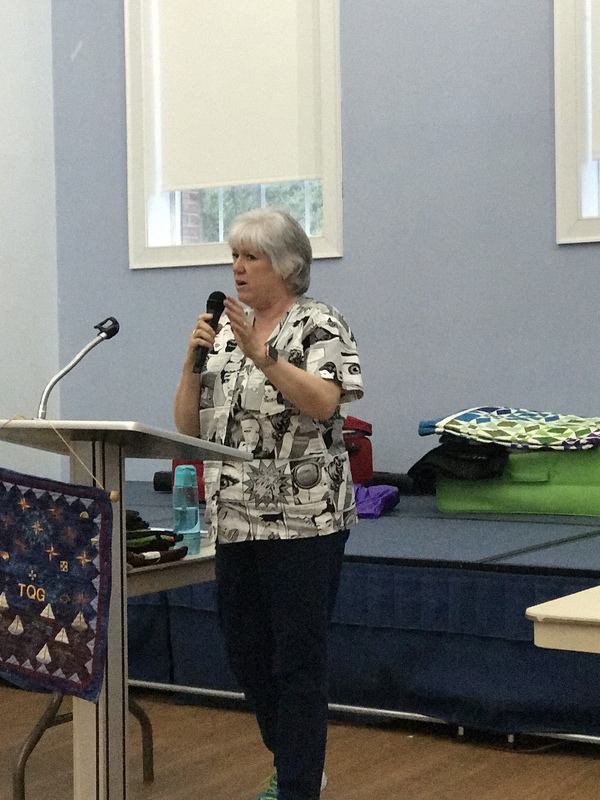 Next week I head south to the Mid Atlantic Quilt Festival in Hampton Virginia. 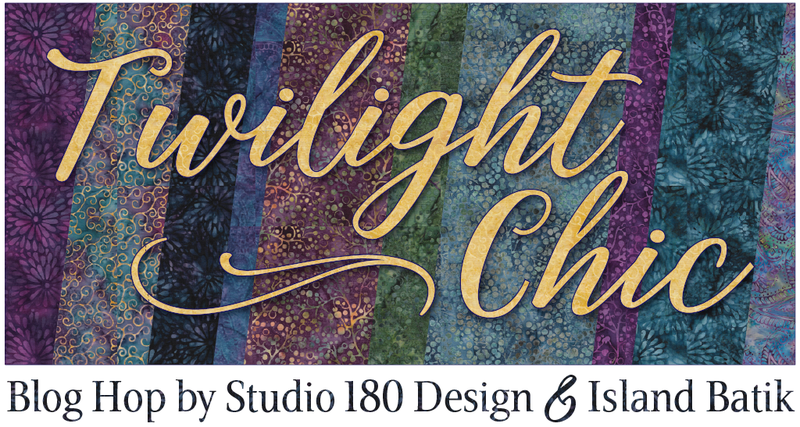 I will be helping out Deb Tucker at the Studio 180 Design Booth, so please, if you are there stop by and say hello. 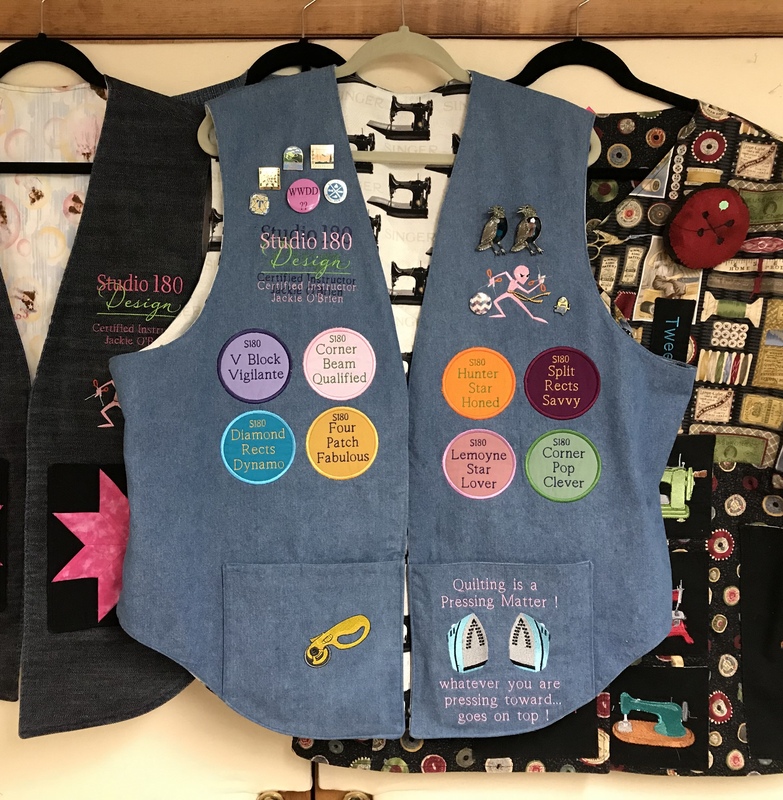 I’m sorry I will have to miss my local guild “The Mohawk Valley Quilt Club’s” 35th Anniversary celebration. 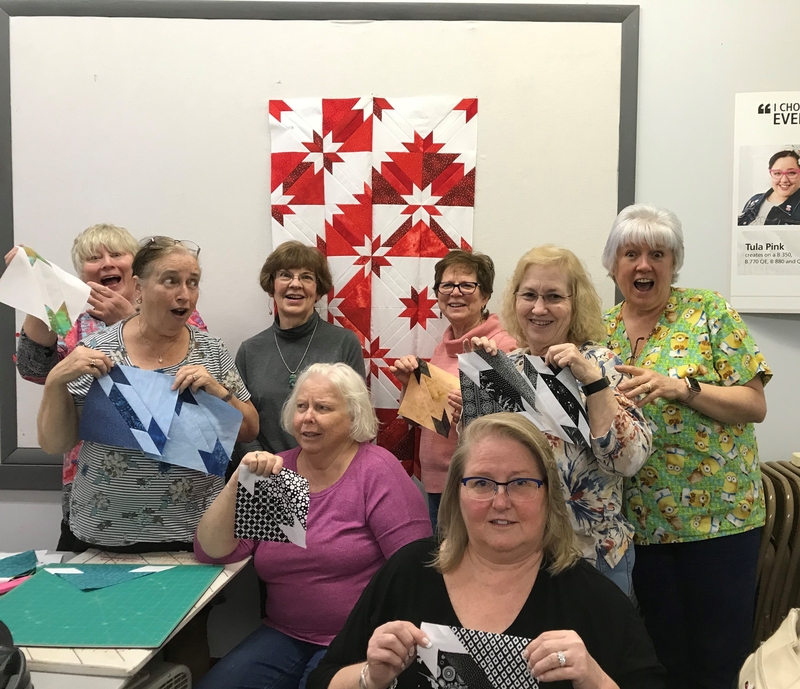 Congratulation to a great group of quilters. I’m test driving my new Nolting quilt frame. It is pretty spectacular. Having a commercial frame makes my mid-arm work better. 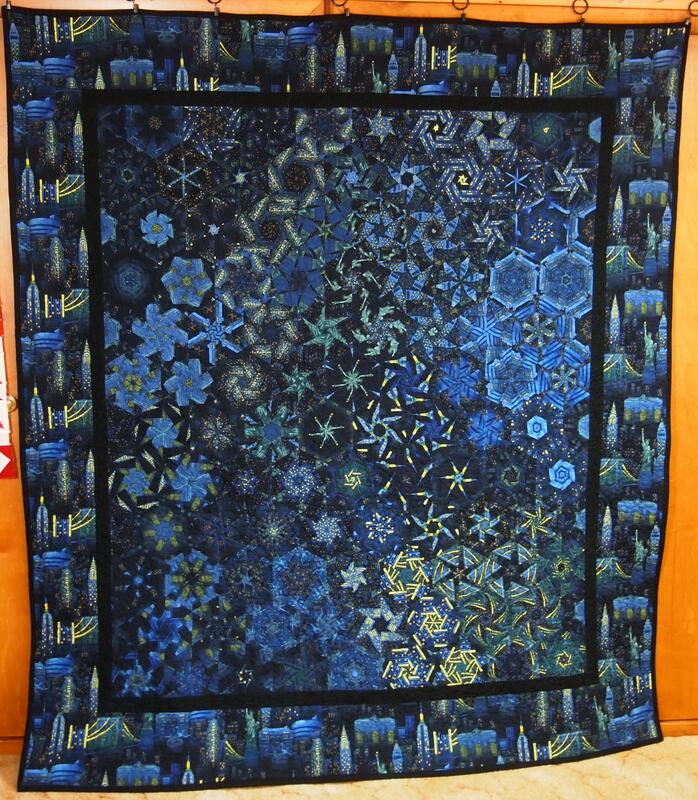 I have dreams of improving my quilt skills immensely. I bought the frame from Delightful Quilting & Sewing. Joyce and Ron Blowers are Nolting Dealers and drove 3 hours to my house in a snow event and set it up for me. I really liked them a lot! I need to take some lessons from Joyce. 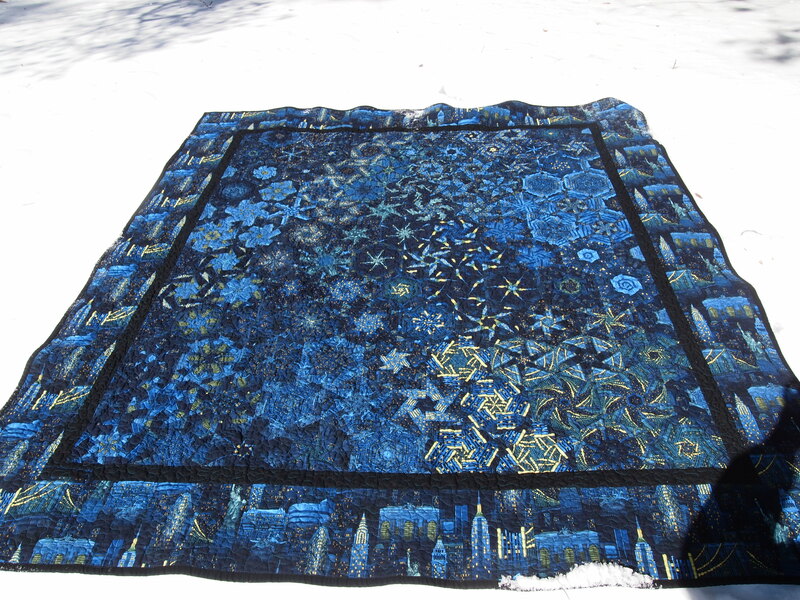 I usually finish my quilts in the order they are pieced, (just a little OCD) but I wanted to finish “I Love New York” to celebrate the mountains of snow we have, with more on the way. 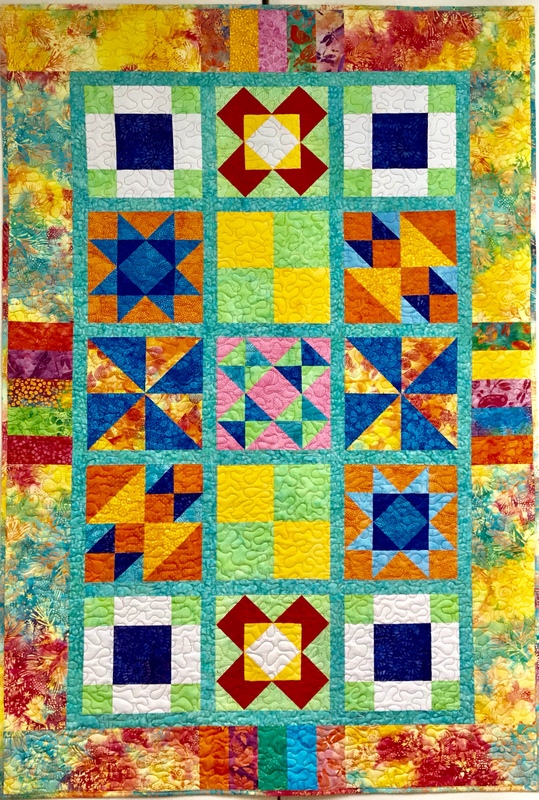 There is a group on Facebook called “One Block Wonder Quilt Forum”. 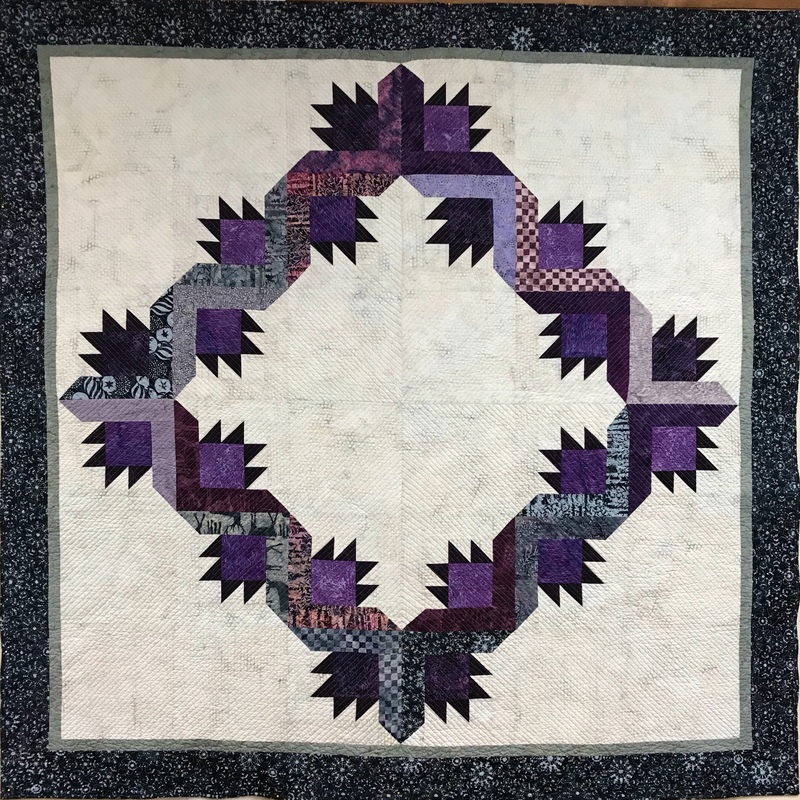 Someone asked me how I quilted my hexagon quilts. I meander mine, not just because that’s all I know how to do, but by going over every seam and center they lay nice and flat. 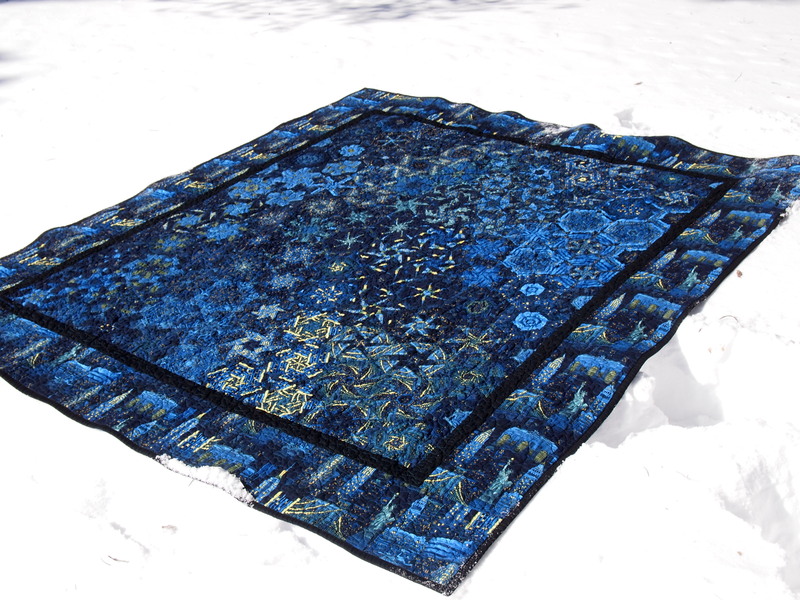 I was trying to be arty and photograph my quilt out in the snow, but there is so much snow (close to 3 feet in parts of my yard) I had a very difficult time getting a good angle. So I gave up, scraped off mounds of snow and came inside. 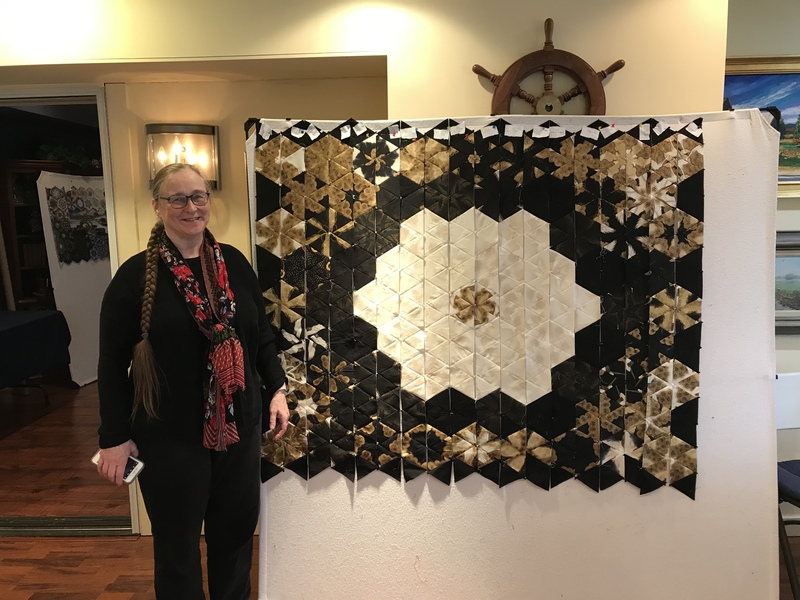 This entry was posted in Hexagon Quilts and tagged Deb Tucker, Hexagon Quilts, Nolting Quilt Frames, OBW Quilts, quilting, Quilts, Studio 180 Design on February 16, 2015 by ifthesethreadscouldtalk. Beautiful. Taking my first stack and whack class end of Feb.
Have fun, it is a great technique! Can’t wait to see you. Hope the weather does not delay you. We are at 19 degrees so you know the town is going crazy – Farm Fresh was jammed. Love, love this new Hexagon quilt. Pretty amazing! I made a OBW a couple of years ago with the same fabric. Mine is called City Storm and has a lightening bolt through it and a very different border. 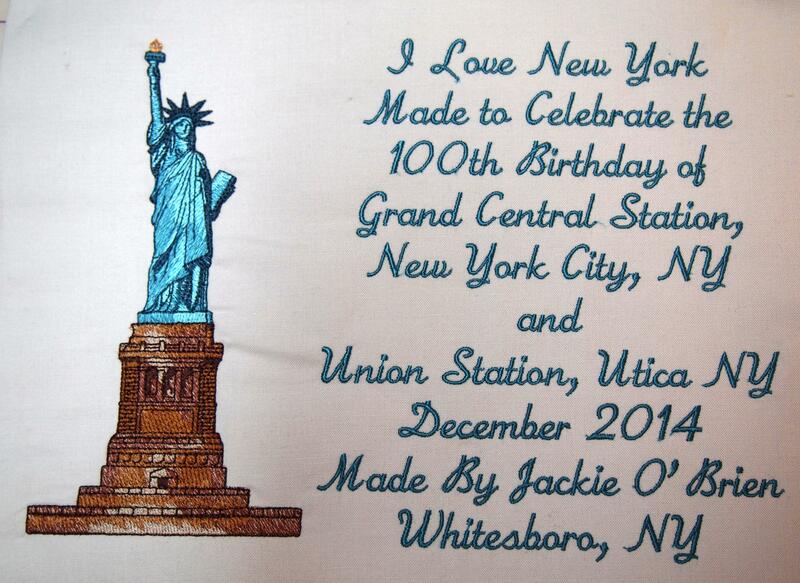 I thought the fabric was so fun with the Empire State Building and the Statue of Liberty etc twirling around! My inspiration was from seeing a lightening strike in a sky scraper reflection in Houston and seeing this fabric for an OBW took me back to it. Your quilt looks great! Thanks, I wish I could see yours. 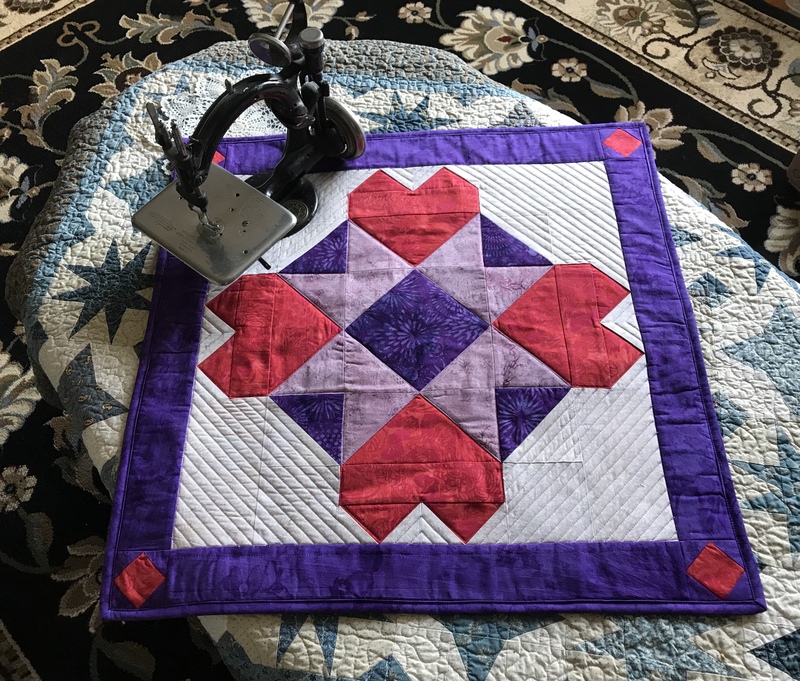 Hi Jackie, I just wanted to tell you how much I love you OBW quilt. The first time I saw one, I knew it was something I had to make, so I scoped out the internet and found a very good video tutorial. 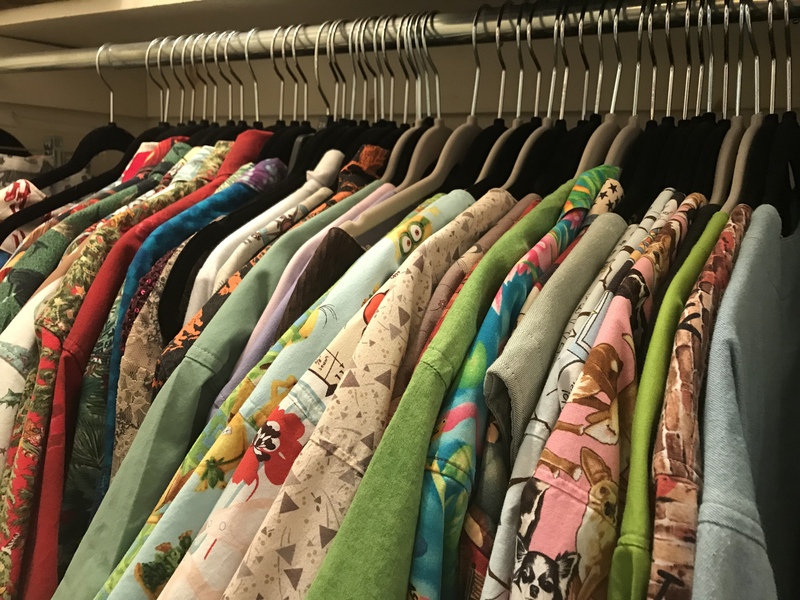 I know the type of fabric and repeat are very important in how it all plays out, and the ones I’ve seen have been made using fabric made up of large jungle cats, but that fabric by Timeless Treasurers is no longer available, and I was wondering if, using a floral fabric as an example, you could provide me with the names of a couple of currently available fabrics that would work well on the OBW. That would give me an idea of what to look for. 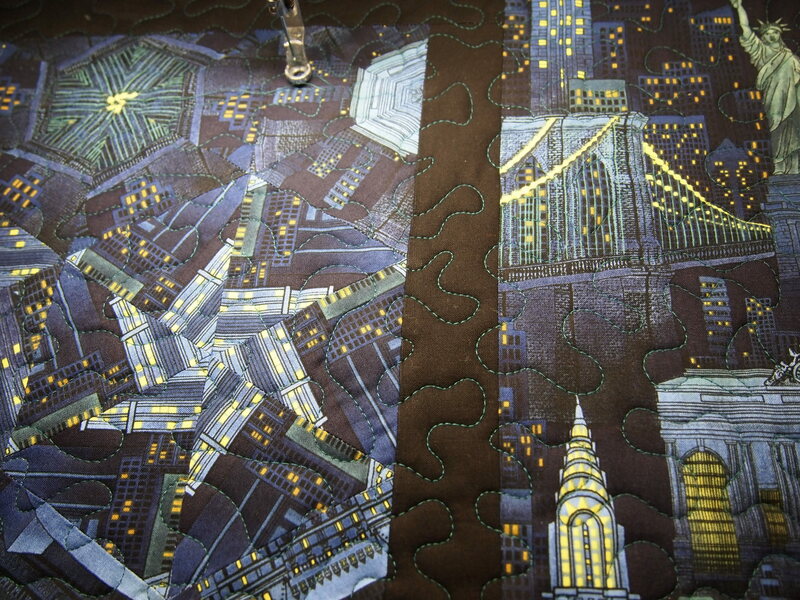 The video tutorial I saw used the same NYC fabric you did, and it was beautiful as well. I live in the Chicago area, so that fabric wouldn’t work for me. SORRY! Thanks in advance for any help you can provide. The videos you saw were probably mine. I’m sorry but I haven’t been out lately so I’m not sure what is available. 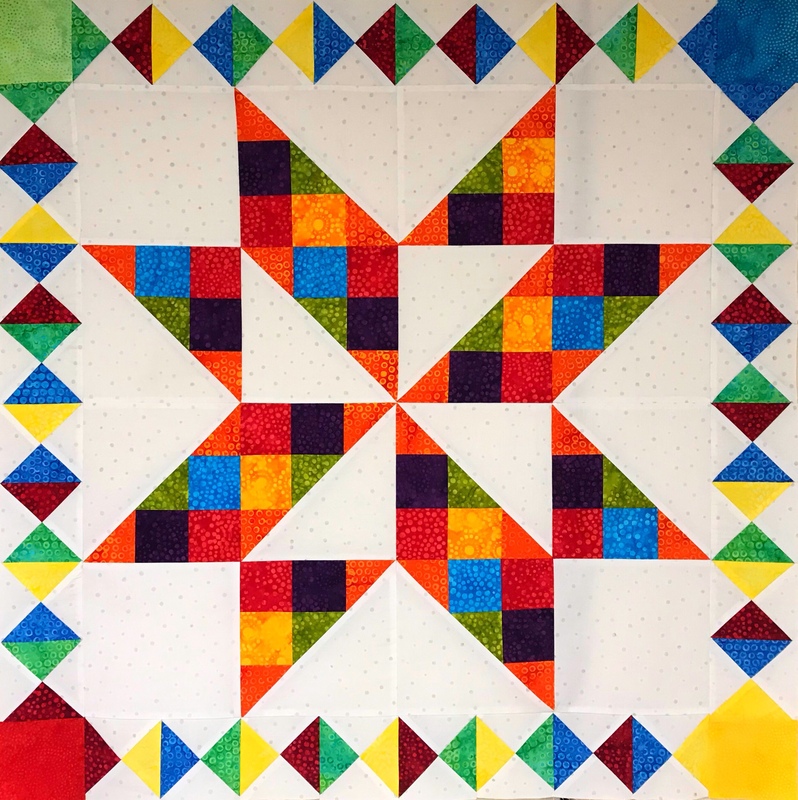 On my blog is a post called Fabric Selections for Hexagon Quilts, it will give you an idea of what works well. It is not just the repeat but the size of the design as well. 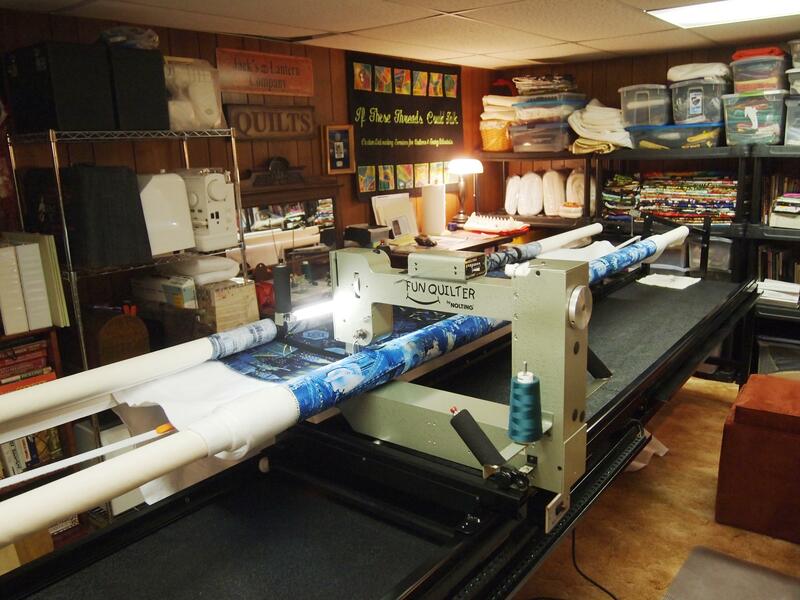 Remember you are cutting the repeats into 3 3/4″ strips, if your design is smaller than that you won’t be taking the design apart. If you shop online you should try eQuilter.com they show the size of the design. Good luck!